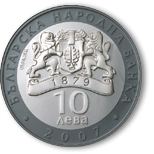 The obverse, in the inner circle, features the emblem of the Bulgarian National Bank, with the year ‘1879’ on the ribbon and the nominal value ‘10 ЛЕВА’ (10 BGN). 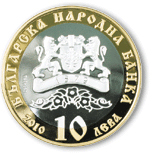 In circumference along the outer circle go: ‘БЪЛГАРСКА НАРОДНА БАНКА’ (Bulgarian National Bank) and the year of issue ‘2007’. 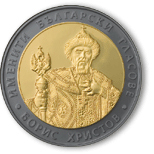 The reverse, in the inner circle, features the distinguished Bulgarian opera singer Boris Hristov, as Boris Godunov from the opera of the same name. In circumference along the outer circle goes the wording ‘БОРИС ХРИСТОВ’ (Boris Hristov) and ‘ИМЕНИТИ БЪЛГАРСКИ ГЛАСОВЕ’ (The Great Bulgarian Voices).